As part of the Make in India initiative, 25 focus sectors have been identified and a majority of these sectors are a major consumer of aluminium. Aluminium industry is the largest non-ferrous metal industry in the world. Aluminium ranks second, next only to steel, in terms of volumes used due to its versatility, and its application have extended to various economic sectors. The Indian Aluminium industry is the mainstay for Indian economy and major contributor for nation building. As part of the Make in India initiative, 25 focus sectors have been identified and a majority of these sectors are a major consumer of aluminium. Aluminium is a sector of strategic importance due to its role in energy security, national defence, aerospace, automobile, infrastructure, packaging etc. and critical for the government’s visionary initiatives -Make in India, Smart Cities, Power for All, and indigenous space programs. India’s current demand of aluminium is growing at ~10% per annum. Anticipating the rapid pace of aluminium consumption in the country, the domestic primary producers have made investments of Rs 1.20 lakh Cr ($20 billion) in the last few years to enhance the capacity from 20 lakh tons to 41 lakh tons per annum which is sufficient to cater to the domestic demand of 36 lakh tons per annum (in FY18). Despite this, around 60% of country’s demand is being met through imports as the share of domestic industry declined to 40% in FY19. FY17-18 witnessed the highest ever aluminium import of 19.6 lakh tons, resulting in a forex outgo of Rs 30,000 Cr ($ 4.5 billion) in FY18 (i.e. 1% of total Indian imports). At the current pace, aluminium import will result in an estimated forex outgo of Rs 40,000 Cr($5.6 billion) in FY18-19. Globally, several countries have taken drastic steps to protect their domestic industry and the fallout of these recent global developments have adversely impacted India’s aluminium industry which has been crippled with imports. In March, 2018, the US government under President Trump went a step ahead to protect the US domestic steel and aluminium industry and imposed 10% and 25% respectively as import tariff, triggering a global trade war. 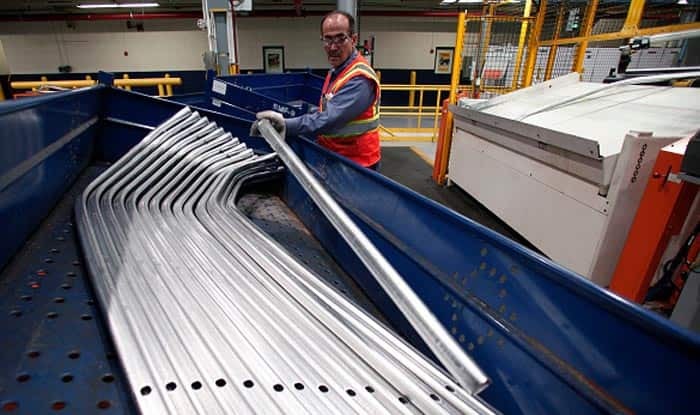 As a retaliatory measure, China, the largest aluminium producer in the world, imposed a 25% duty on US aluminium scrap that accounts for almost 50% of its imports. Additionally, the Ministry of Ecology and Environment (MEE) in China has added aluminium scrap in its restricted import list, effective from July, 2019, with a plan to completely ban all scrap and waste by the year 2020. Due to these measures, the global scrap supply chain will get diverted towards India, as EU and other developed countries have stringent standards for scrap import. In fact, the domestic aluminium industry has started bearing the brunt with aluminium import witnessing a 22% growth for the April -November period of FY18-19 over the corresponding period of last year. This is in contrast to a decline in the growth of domestic sale which is at mere 0.8%. Being the fastest growing economy, India is the most natural market for these countries to dump surplus aluminium. Scrap import from USA alone has grown by 142%, while the total scrap import shipments increased by 20% during the same period. The global developments, on the one hand, have resulted in the crashing of London Metal Exchange (LME) prices — the benchmark prices for metal trading globally. In the last eight months, Aluminium LME prices crashed by ~$500/MT (i.e. 23% from $2290/MT in May 2018 to $1800/MT level in January 2019). On the other, the industry is also crippled by increasing production costs which have gone up significantly by ~$525/ MT (~30% for overall industry) in last 3-4 years due to increased cost of raw materials, coal cess, Renewal Purchase Obligation, electricity duty, logistics costs and various other factors. Together, they have adversely impacted the sustainability and competitiveness of aluminium industry. India is yet to follow the global trend and take any action needed for protection of the domestic aluminium industry. The domestic production needs to be encouraged to create self-sufficiency for catering to increasing demand, and country should not be dependent on imports. Aluminium imports in India are totally non-essential in nature as India has sufficient domestic capacity. Restricting Aluminium imports will result in saving $ 5 billion Forex outgo. Going forward, Indian Government should take bold steps to enhance competitiveness vis-a-vis global players for the revival of the domestic aluminium industry. The immediate measure to support domestic industry by increasing customs duties on aluminium metal to 10% and establishing import duty parity between primary aluminium and scrap will help curb imports, save foreign exchange reserves and encourage domestic aluminium consumption. In addition to this, further support should be extended through adequate safeguard measures similar to those adopted for the Indian steel industry in last three years.